The Pipe Yard is one of the places found in Bowser's body during the events of Mario & Luigi: Bowser's Inside Story and its 3DS remake that is apparently located in Bowser's ear. There are many different pipes in this area that connect to locations all over the Mushroom Kingdom, such as Dimble Wood, the Toad Town Caves, and Bowser's Castle. 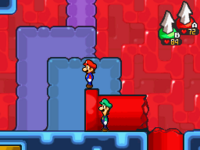 As the game continues, Mario and Luigi learn new moves and can reach more pipes that were not accessible before. In parts of the game, the player needs to head to the Pipe Yard to leave Bowser's body. The Red Pipe falls only after Bowser gets electrocuted. Before that it is standing like any normal pipe making the rest of the area inaccessible. Inside a cracked wall near The Toadley Clinic. On a ledge near the path to Cavi Cape. On a ledge east of the Tower of Yikk. East of Bowser's landing site from Peach's Castle. East of the lobby, there is a vent which Mario and Luigi have to dig under. In a path Junker cleared up. 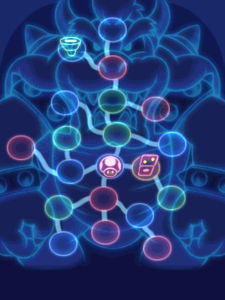 When the player breaks the machine made by Dr. Toadley, it is odd that the "vents" work in Bowser's Body, as the machine was in Toad Town. After the red Pipe is destroyed, if Mario and Luigi attempt to leave Bowser's body while something is going on (such as if another area in Bowser's body is required to enter to continue the story), Starlow will stop them and tell them to check out what Bowser is doing. 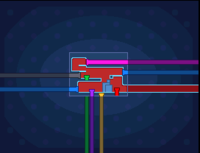 The pink Pipe can be accessed early when Mario and Luigi learn how to use running vents. However, when Mario and Luigi go through the vent, debris and a gate will be blocking the exits. Once the Pipe Yard is available, if Mario and Luigi go out of Bowser's body and to where Bowser is located, he will not be there for unknown reasons. The only exception is if the player goes to the security system in Toad Town Caves where Bowser is stunned. This page was last edited on January 14, 2019, at 21:20.